Apple CEO Tim Cook and a small battalion of his lieutenants took to a stage today in a fast-paced keynote that pushed back against talk that lagged behind rival in artificial intelligence (AI) and opened some of the company's crown jewels to third-party developers. Monday's Worldwide Developers Conference (WWDC) keynote focused on software and to a lesser extent than last year, on services, touting small and not-so-small improvements to all four of its operating systems: macOS, iOS, tvOS and watchOS. Cook spent relatively little time holding court, and the keynote was much more structured, and clearer, than last year's event, said Jan Dawson, chief analyst at Jackdaw Research. "Last year was rough and a bit of a mess," said Dawson of 2015's WWDC keynote, which went long. "It felt unstructured, as if they crammed too much in. They learned from that this year. Today's was very structured, but yet covered more ground and never felt out of control. And each presenter handed off to the next, rather than have [Cook] back out to introduce each." Throughout, Dawson said, Apple made two major statements to developers, and peripherally, to customers as well. "They pushed back on the narrative that Apple is handicapped in AI," said Dawson. "But not directly. They dropped in the right terms here and there, but really, what they did is show, not tell." Dawson was referring to the talk circulating among pundits that Apple was behind rivals -- including Facebook, Google and Microsoft -- in the battle to bring more intelligence to technology. "What Apple did was show how their products were getting better" with more intelligence, Dawson added, citing improvements to Siri as the prime example. Patrick Moorhead, principal analyst with Moor Insights & Strategy, concurred. "Apple responded nicely to the threat put in front of them by Google and Microsoft," said Moorhead, "and showed that they've been working on AI improvements for a long time." Like Dawson, Moorhead called out Apple's "show me" strategy of the keynote. "Apple didn't exactly show how a conversational bot would work, but what they did show was how three people could order food from the same menu without having a bot." Both Dawson and Moorhead also identified a second thread in the presentation: Apple opening up important APIs (application programming interfaces) to outside developers. "They opened up the crown jewels," said Moorhead, ticking off Siri, Maps and Messages, three first-party apps that until today were only available to Apple's engineers. "Now they're created a messaging platform that's open to commerce and voice." "They opened up domains that were Apple's exclusive playgrounds," Dawson added. "That will create some new business models for developers and new types of apps." Craig Federighi, who heads OS X and iOS development, unveiled 10 improvements and additions to iOS 10. But while he ticked off 10 items, some were more equal than others. As rumored, Siri will be opened to third-party developers to expand the assistant's capabilities on iOS. Out of the box, iOS 10's Siri will work with several of the most popular apps, letting users say, "WeChat Nancy that I'll be five minutes late," as Federighi demonstrated, to hand off the task to WeChat. Siri will also integrate with other apps, including Skype, Pinterest and Uber for specific chores such as calling, pulling up photos and requesting a ride. On the photo side, iOS 10 will use facial, object and scene recognition to categorize, then locate images. With the stress lately on artificial intelligence by rivals Microsoft and Google, it wasn't surprising that Federighi said "AI" more than once to talk up, and then demonstrate, new features in iOS's Photos apps. Dubbed "Memories," the feature brings specific images to the forefront, those selected by algorithm to highlight, for example, individuals' faces or certain locales. Memories also auto-assembles photographs into collection, a recognition that people take stills and video, but rarely put them into any kind of organization. iOS's most-used first-party app -- Messages -- also got a whirlwind of new tools, including customized text balloons, obscured images that appear with a slide of the finger, larger emojis, rich links, and Digital Touch, the draw-on-the-screen feature brought from watchOS. "Apple's enhancements to Messages acknowledges fun that has driven messaging apps, but stakes out own ground," argued Ross Rubin, an analyst at App Annie, in a tweet during the keynote. And Apple will open Messages' APIs so they can, for instance, craft animated "stickers" for use in texts, or send payments and order food via Messages. iOS 10 will support devices as far back as the iPhone 5 and iPad 2, the former from 2012, the latter from 2011, and both now discontinued. Federighi also introduced OS X ... er, macOS. As expected, Apple recast OS X as macOS today, putting the Mac's operating system into the same format as the company's other OSes. Federighi also tagged the upgrade as "Sierra" -- the long form as "macOS Sierra" -- to keep with the cadence of California place names. 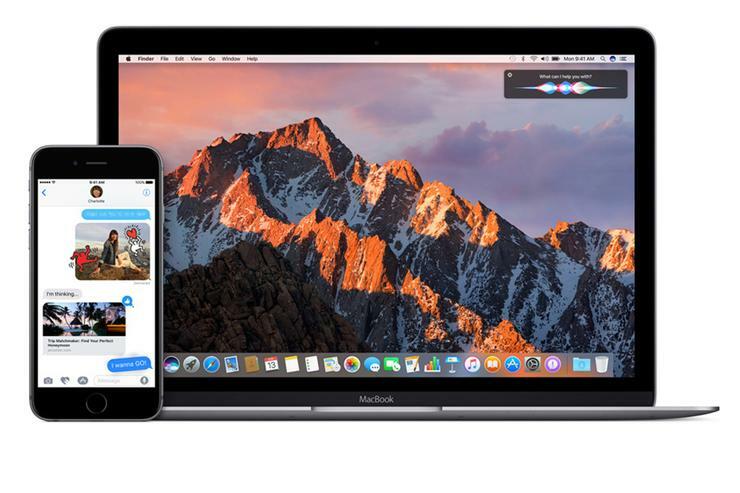 Blitzing through the new features, Federighi introduced Siri -- Apple's digital assistant -- on the Mac, a migration that many have expected for years. Siri will respond to searches and commands, just as she does on the iPhone. Also new in Sierra, said Federighi, were Continuity enhancements that included a link between an Apple Watch and a Mac for authenticating the user, eliminating the password necessary to log onto the machine; and a universal clipboard shared between multiple Macs as well as iOS devices. iCloud Drive, Apple's online storage service, got some attention in Sierra as well, with an expansion to sharing desktops -- not just documents -- and something called "optimized storage," which sweeps old-but-still-useful data and files into the cloud and dumps no-longer-needed data into the dustbin. macOS Sierra, like last year's El Capitan, will go into public preview in July and ship this fall. Registered developers can grab the new operating system today. Apple also introduced watchOS 3, an upgrade to the year-plus-old Apple Watch, with several user interface (UI) and user experience (UX) tweaks, including Scribble, which lets owners trace letters on the watch face with their finger, one at a time -- say, C-A-L-L J-O -- to reply to an incoming message. Scribble works in both English and Chinese, the latter an obvious nod to Apple's critical market in the People's Republic. Apple Pay can also be embedded within third-party developers' Watch apps with version 3. WatchOS 3 was released to developers today, and will be available as a free upgrade to all Watches this fall. Eddy Cue, Apple's top internet software and services executive, touted improvements to the Apple TV and its tvOS. Apple will issue an iPhone app that duplicates the functionality of the Siri-powered remote, including gameplay, implemented via the iPhone's sensors. Also getting some serious applause from developers was single sign-on, which with one set of credentials logs the user onto all her network apps, whether DirecTV, HBO or Hulu. Cue also briefly covered a revamp of Apple Music on the iPhone and called the user interface (UI) remodel "more intuitive" than the original. Cue then passed the baton to Bozoma Saint John, an Apple Music executive who brought some energy to the presentation -- and demonstrated that the audience wasn't willing to get up and dance -- as she stepped through the streaming service's changes.